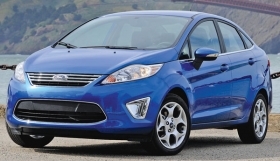 The Ford Fiesta and other new models will boost second-half production. Except for Toyota, automakers' 3rd-quarter output in North America will be up by double digits from 2009. As usual, automakers will slow production in the third quarter -- but sustain a pace that reflects a pronounced recovery from last year's depressed levels. Third-quarter output of 2.8 million light vehicles will be 21 percent above last year's pace, according to a new forecast by CSM Worldwide of suburban Detroit, a unit of IHS Inc.
That would be 4 percent below second-quarter levels -- the first quarter-to-quarter drop since the first quarter of 2009. It amounts to a return to normalcy: Production typically hits a trough in the third quarter because of summer shutdown and various U.S. and Canadian holidays. But the predicted third-quarter decline also shows that production isn't getting out of hand. "Automakers are being very calculated about keeping their inventories under control," says Mike Jackson, IHS director of North American forecasting. "Demand has been strong, and it will continue to increase. But right now it is a stable demand, and you're seeing the manufacturers balance production to stay in line with it." Still, the production forecast is more aggressive than expectations for U.S. sales. Analysts predict 2010 vehicle sales of about 11.5 million, which would be an 11 percent gain from 2009. Jackson anticipates production will increase further in the fourth quarter as consumers respond to several new-model launches. The Honda Odyssey, Chevrolet Cruze and Volkswagen Jetta will launch later this year. Ford already is ramping up production of the new Fiesta. In the first four months of the year, U.S. sales rose 17 percent while North American production rose 64 percent. In April, sales jumped 20 percent to 982,302. CSM forecasts most automakers will post strong double-digit increases. CSM projects Honda Motor Co.'s North American output will top Toyota Motor Corp.'s, rising 30 percent to 353,700. In contrast, Toyota output is projected to rise just 1 percent, to 347,900. Those numbers reflect the closing of its Fremont, Calif., plant, New United Motor Manufacturing Inc. A spokesman said production is increasing at all other North American plants. CSM predicts the smaller import brands, including Hyundai, Kia, Subaru and BMW, will increase their combined North American output 44 percent.